Purefecto: The last hurrah before summer ends! Everyone knows that to make a great summer drink, you must have the right tools! Luckily for us, Two Tone Studios have came up with some fun color cups and pitchers to enhance festivity! Each pitcher has an optically interesting ball on the side to support your hand when pouring. 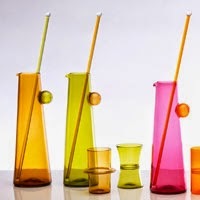 Comes in gold, olive, ruby, purple and gray jewel tones, with stir sticks.